Has it been one of ‘those days’? 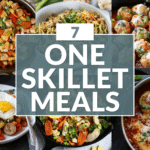 Check out these 3 Ways to Make a Meal in Under 10 Minutes so you can forget about takeout! We all have ‘those days’ when the to-do list is too long, the dog needs to go to the vet, your appointment ran long, you had back-t0-back meetings, you got stuck in traffic and you had a kid spike a fever at daycare. You know, one of THOSE days. One of those days when you just can’t even fathom putting together a healthy meal much less stopping by the store to pick up everything you need to make said healthy meal. This is hands down one of our most tried and true methods for mealtime sanity. Sure, it takes some planning and some time to prep and cook but the time you put into it now will pay off in spades later on. Basically, your future self will thank you. 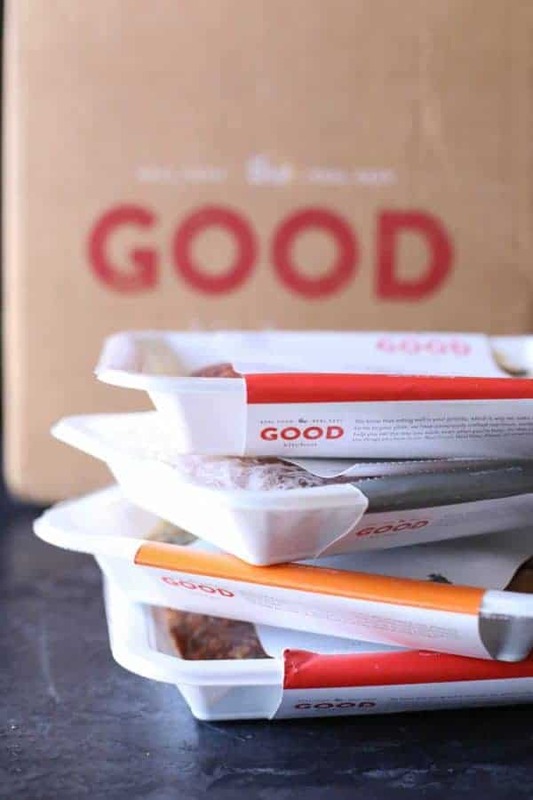 Just think, the meals you prepped on the weekend could be waiting for you when you need them most. Seriously, there’s just nothing better than knowing you’ve already got a meal in the fridge that you just need to reheat and eat. Nothing better, friends! 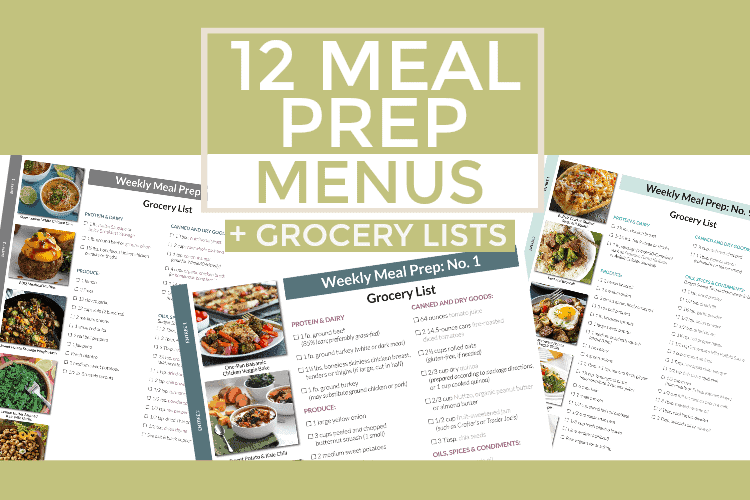 To help you just crush this whole meal prepping thing, we’ve rounded up twelve of our Meal Prep Menus that feature done-for-you grocery lists and five recipes you can knock out in just a couple hours. Another one of our secrets to mealtime sanity is batch cooking, which admittedly, sounds scarier than it actually is. 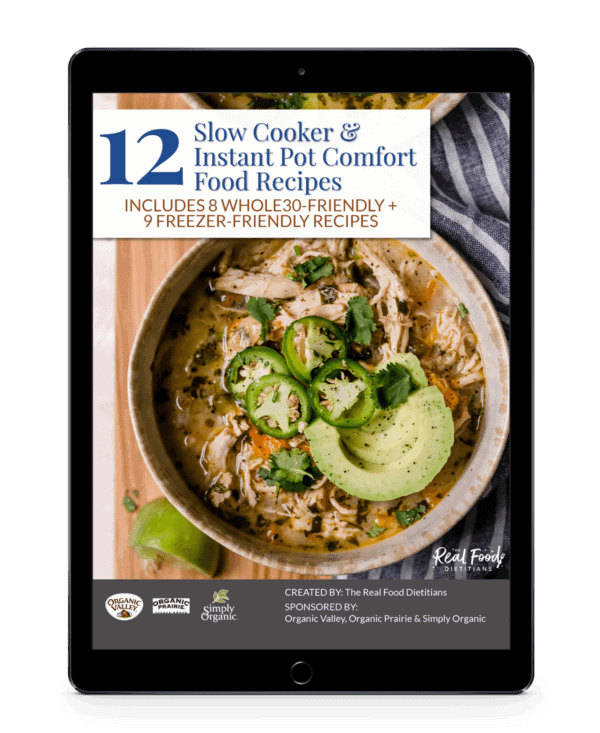 Batch cooking doesn’t mean spending your entire day in the kitchen preparing freezer meals for the entire month (though if that’s your jam, don’t let us stop you – you’re our hero). For us, batch cooking means doubling freezer-friendly meals and snacks whenever you can. If you’re making soup or chili, why not double it and portion it out into individual portions so it’s quick to thaw and reheat? The same thing goes for BBQ beef, meatballs, waffles, muffins, pancakes, breakfast sausage or a pan of cheesy pasta. Pro Tip: Freeze soups and stews in quart-size freezer bags by laying them flat on a baking sheet. 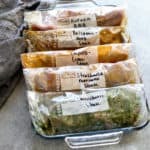 When they’re frozen, stand them up in a shoe box-size plastic tote in the freezer. So they’re like, you know, a library card catalog. Annnnnnd I just dated myself there. Combine healthy convenience foods like precooked proteins, frozen stir-fry or fire roasted veggies, bottled sauces, etc. 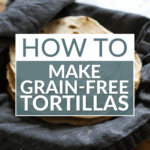 to create an easy stir-fry, taco or fajita bowl, salad or scrambled eggs and veggies. Canned tuna or sardines, precooked chicken strips (like these from Applegate) or roast beef, frozen turkey or chicken patties, precooked frozen shrimp, frozen vegetable blends and cauliflower rice or vegetable ‘noodles’, jarred curry sauce or spicy almond sauce (like those from Yai’s Thai which also happen to be Whole30-approved), pesto or sugar-free marinara sauce. Good quality sausages or hot dogs can also go a long way in a pinch (think wrapped in lettuce and topped with your favorite mustard, diced avocado and sauerkraut!). And don’t forget about eggs. 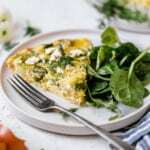 Serve them up any way you like with a side of leftover veggies or scramble them with a few handfuls of greens and some cherry tomatoes to get the job done quick. And salad. Let’s not forget about the ultimate quick and easy meal. Whenever we make a salad we make at least two so there’s always one in the fridge when needed. 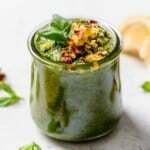 No need to get fancy, just use what you have on hand and pair it with a can of low-mercury tuna, a few olives or some dried fruit and nuts then drizzle it up with a delicious pre-made salad dressing. 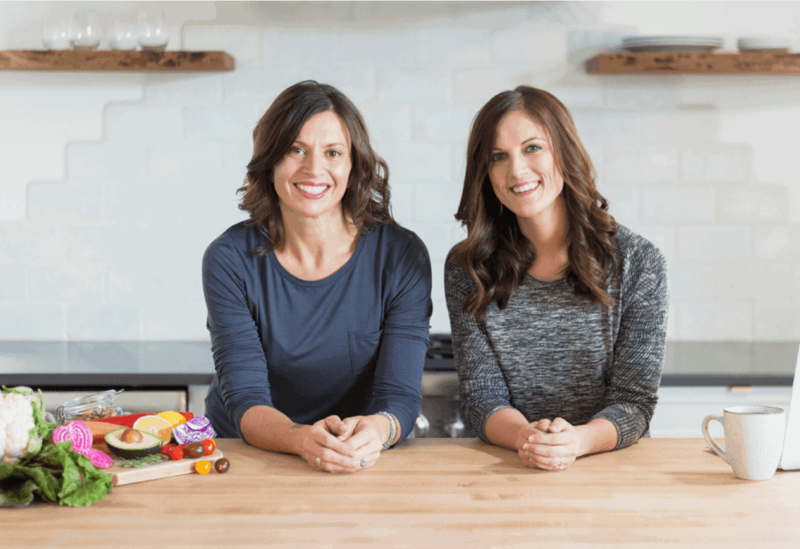 This is by FAR the easiest option you’re going to find and it’s become our saving grace for those really busy days when even the thought of doing anything more than lifting a finger is just too much. Or when we literally find ourselves juggling a dozen tasks and crossing our legs while taking photos because there’s no time to stop and pee. Emails to be answered, kids picked up from school and shuttled to tutors, flights to catch, puppies to housebreak, errands to run, meetings to make. You get the idea. 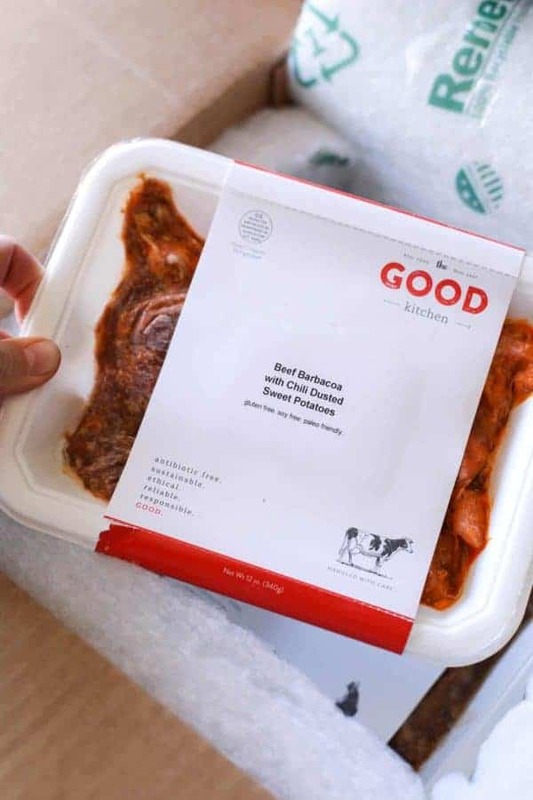 So rather than reaching for a bowl of cereal or a protein bar we reach for a fresh, fully-prepared meal from The Good Kitchen that’s ready in just 3 minutes. A meal made with high-quality ingredients with a focus on taste and sustainability. A meal made from scratch using organic produce and grass-fed, finished, pastured and antibiotic/hormone free proteins. A healthy meal that’s ready when we are. Sound to good to be true? It’s not. 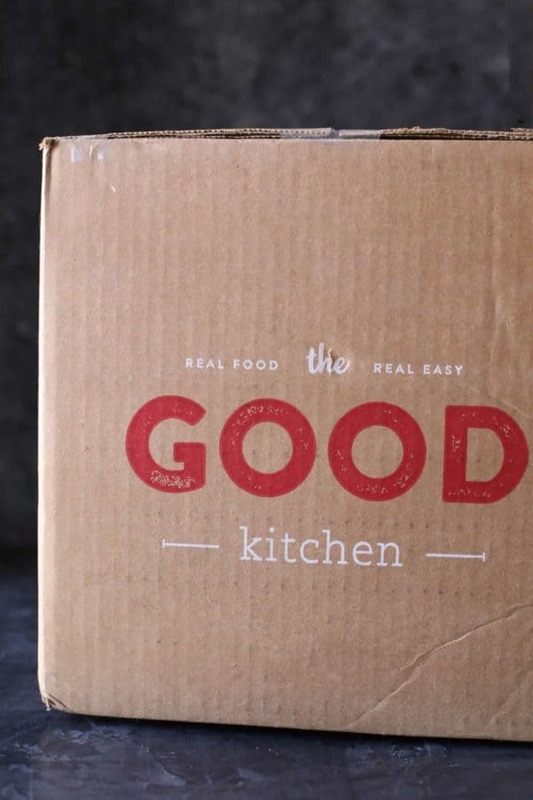 It’s The Good Kitchen and it’s our true ace in the hole when life gets messy. 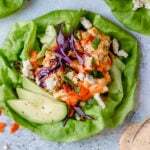 You can check them out for yourself and save 15% on your first order when you use the code REALFOODRDS. The best part is that you get to call the shots. 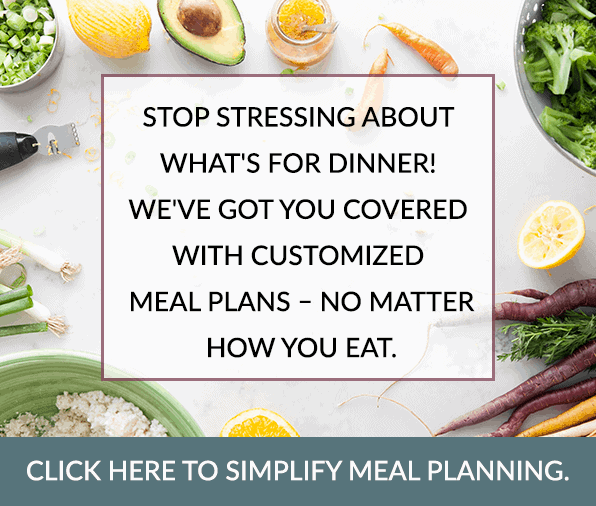 You decide how many meals you want each week, whether you want them every week or just want to place a one time order. Side note: One time orders also make great gifts for new parents or a friend in need! Just make sure to order a few for yourself, too. I mean, c’mon. 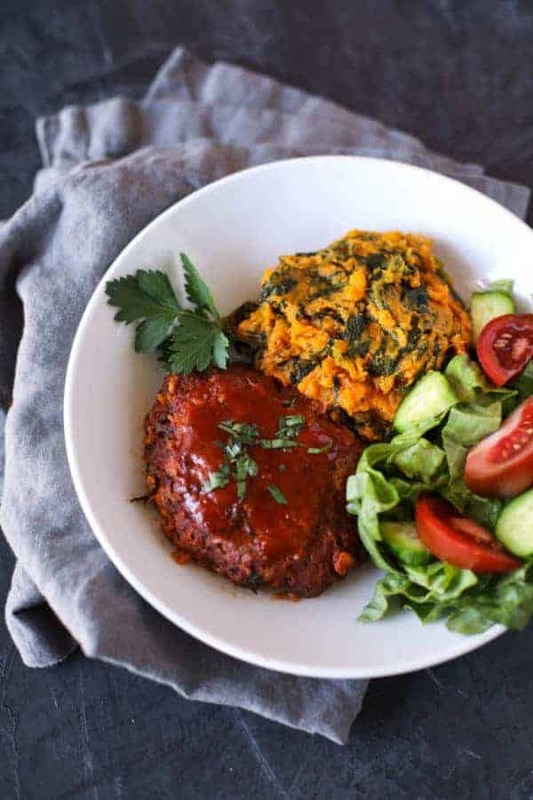 How good does this BBQ Meatloaf with Mashed Sweet Potatoes and Kale look?! Ready in 3 minutes which is just enough time to throw together a salad and maybe even pour yourself a glass of wine. There you have it, our 3 ways for making a meal in under 10 minutes! We hope you found a few gems here that you can put into play for the next time you have one of ‘those days’. What’s your favorite 10 minute meal? 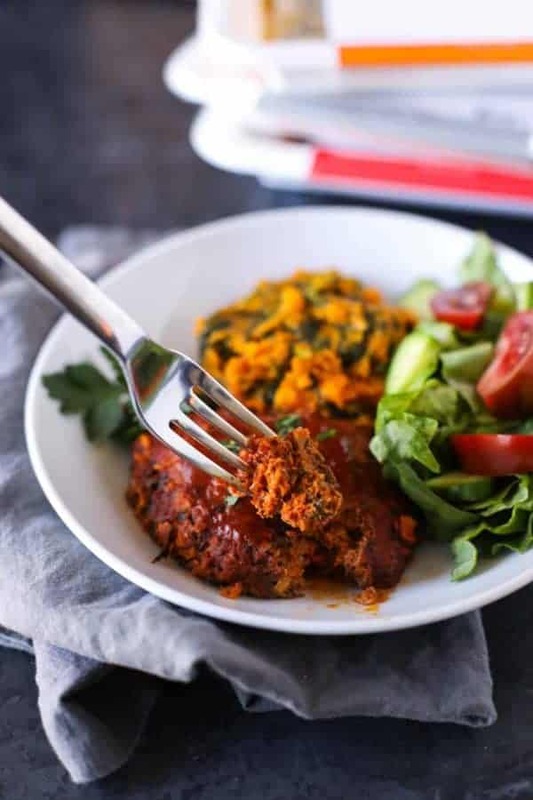 Got any secrets for making healthy meals super fast? Share in the comments below!